Banana Republic is thanking troops (Veterans and Active!) as well as their family!! 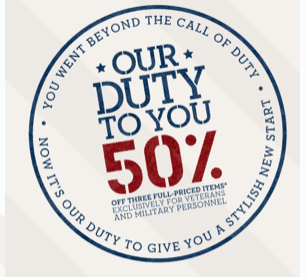 Banana Republic is giving Military folks 50% off 3 regular priced items from 1/19-1/22, in-stores only. There will also be a special shopping event on 1/20 from 10-1 at select stores (check out the list here)!